Both Medicaid and private payor dental claims audits are increasing around the country. (December 18, 2017): As you may recall, in July 2017, the Department of Justice (DOJ) and the Department of Health and Human Services, Office of Inspector General (HHS-OIG), conducted the largest ever health care fraud enforcement action ever held on a single day. Two of the health care professionals arrested during this national “Takedown” were Michigan dentists, both of whom were alleged to have billed Medicaid for services not rendered. Unfortunately, as we will discuss in this article, examples of dental claims audits, investigations and prosecutions have become quite common. In October 2017, Michigan’s Attorney General announced that his office had successfully apprehended a fugitive dentist that had been convicted in May 2017 of twenty counts of Medicaid fraud, six counts of health care fraud, and one count of racketeering. These incidents of fraud first arose after the dentist was “excluded” from participation in the Medicaid program in 2006. To get around the exclusion, he allegedly provided dental services to Medicaid beneficiaries and billed for his services under the identifying information of another dentist. Before he could be taken into custody, the defendant apparently fled to the Dominican Republic. He was captured by officials of the U.S. Marshal’s Service last October. If you think that this is an isolated story about a sensational dental fraud case, think again. Just last week, the local news in Anchorage, Alaska spotlighted the fact that a local dentist who had been charged with Medicaid fraud was back in court. As the television anchor reminded her audience, this story first made national headlines after a video surfaced which showed the dentist allegedly performing a dental procedure on a sedated patient, while on a hoverboard. Has there been a change in law enforcement’s focus with respect to dental providers? Is your practice now more at risk of a dental claims audit than ever before? These are the questions we will look at in this article. I. Background – Insurance Coverage of Dental Services. The Centers for Medicare and Medicaid Services (CMS) estimates that in 2016, health care spending increased 4.3% and cost approximately $3.3 trillion. Notably, approximately 4% of this $3.3 trillion was spent on dental services. The amount of money spent on dental services is more than what is spent on home health services and more than twice what is spent on durable medical equipment each year. (12) where such expenses are for services in connection with the care, treatment, filling, removal, or replacement of teeth or structures directly supporting teeth, except that payment may be made under part A in the case of inpatient hospital services in connection with the provision of such dental services if the individual, because of his underlying medical condition and clinical status or because of the severity of the dental procedure, requires hospitalization in connection with the provision of such services.” (emphasis added). While eligible Medicaid beneficiaries do, in fact, generally qualify for certain dental program services, both the individuals who qualify for coverage and the types of dental services under each program vary from state to state. Although the government-funded dental programs in each of these states may have unique coverage provisions, both law enforcement and Special Investigative Units (SIUs) working for private payors have successfully identified a number of common improper practices and schemes conducted by dental professionals. II. Recent Dental Improper Billing Practices Pursued by the Government. Collectively, both fraudulent and abusive billing dental care practices are illegal and may subject a dental provider to administrative, civil and / or criminal sanctions, fines, penalties and damages. The level of exposure faced is very fact-specific and will vary, depending on the specific dental program that has been defrauded, the conduct alleged and types of damages incurred by the payors and the beneficiaries. A. Audits based on data-mining. The level of coordination and communication between Federal law enforcement investigators, State Medicaid Fraud Control Units (MFCUs) and private payors’ SIUs has grown to the point that they are now extraordinarily effective at sharing information regarding ongoing provider investigations, provider utilization practices, and emerging fraud schemes. Through data mining, they can tell with a high degree of accuracy how long it should take for you to perform all of the dental services you billed in a single day. They will also compare your billing patterns to those of your peers. If any of your billing practices or patterns appear to be irregular, they will initiate an audit. B. Complaints. If you are billing the Medicaid program for services not rendered, you are placing both your financial livelihood in jeopardy and your personal liberty at risk. Under the provisions of the Affordable Care Act (ACA), if you fail to report and return an overpayment within 60 days, you are liable for damages and penalties under the Civil False Claims Act (FCA). The FCA has special “whistleblower” provisions that allow an individual to essentially step into the shoes of the government and file a case under seal against a wrongdoer. If the government intervenes and there is a settlement, the whistleblower can receive between 15% and 25% of the recovery. Essentially, this statute makes virtually every one of your employees a potential whistleblower. If you engage in improper Medicaid billing practices, one of them will eventually identify the wrongful conduct. Do you want to take risk? To make matters worse, the government is not restricted to only pursuing such a case under the civil False Claims Act. Depending on the facts, the government could also pursue the case criminally under 18 U.S.C. §1347 – Health Care Fraud or under 18 U.S.C. §669 – Theft of Embezzlement in Connection with Health Care. Before moving on to the next category, it is worth noting that some incidents of “billing for services not rendered” may be inadvertent. For instance, if a patient comes in for a dental service that requires the performance of a multi-stage procedure (such as a crown, dentures or a root canal), most dental plans will not allow you to bill for the procedure until the date that the final stage of the multi-stage procedure is completed. It is important that you train your billing staff to check each payor plan prior to billing so that multi-stage procedures are billed in accordance with the requirements of each particular payor. If you aren’t sure how a payor treats such a situation, call the payor prior to billing the procedure or fully disclose the status of the stage of the procedure when you submit the claim. 2. Misrepresentation of a non-covered service. In some respects, this improper practice is nothing more than another form of “billing for services not rendered.” Simply put, in the cases we have seen where this has occurred, a dentist or dental practice has either purposely or erroneously characterized a non-covered dental service as a covered service. Keep in mind, the definition of a non-covered service varies from policy to policy. Additionally, the list of non-covered services under a specific policy may change from year-to-year. In any event, it is important that you regularly check to ensure that the services you are providing a patient qualify for coverage and payment. 3. Misrepresentation of the provider of the dental service. This type of billing error is still commonly found in both dental and medical practices around the country. In the cases we have seen, “fraud” wasn’t the reason for the underlying misrepresentation on the ADA Claims form. In most instances, it was a merely a matter of a credentialing delay. In other cases, dental practices appeared to believe that they were permitted to bill for the services under a concept similar to Medicare’s “Incident-To” rule. We will address each of these misconceptions. A. Credentialing delays. Once again, it is essential that you understand the specific requirements under your payor agreement. For example, you are credentialed by PAYOR A, but you decide to hire another dentist. Until the new dentist completes the credentialing paperwork for PAYOR A, turns it in, and is accepted as a credentialed provider, more than likely you can cannot bill for his services a treating provider. As the ADA Dental Claim Form above reflects, there are separate sections for the “Billing Dentist” and the “Treating Dentist.” The section titled Billing Dentist is meant to provide the individual dentist’s name or the name of the group practice that is responsible for billing. In contrast, the section titled Treating Dentist is meant to provide the name of the dentist who actually provided the dental services to the beneficiary, within the scope of his / her state licensure. Unfortunately, we have seen situations where billing staff in offices were unaware of these rules. Since the actual treating dentist was not credentialed by a payor, they billed the services under the name and number of a dentist that was, in fact, credentialed by the payor. As you can imagine, with only a rudimentary review of a dentist’s services in a data-mining review, an auditor is likely to quickly determine that a problem exists. Depending on the payor and the specific facts in the case, a dental practice may be terminated from participation in the plan and may have to repay a significant overpayment to the payor. Both dentists involved in the misrepresentation may be referred to the State Dental Board for unprofessional conduct. Although we have not seen a dental misrepresentation case of this type referred for criminal prosecution, it is important to remember that the ADA Dental Claims form is being electronically submitted to the health plan for payment. Depending on the facts, an aggressive prosecutor could argue that such conduct constitutes wire fraud. 18 U.S.C. §1343. “42 CFR 410.32(3)(ii) Direct supervision in the office setting means the physician must be present in the office suite and immediately available to furnish assistance and direction throughout the performance of the procedure. It does not mean that the physician must be present in the room when the procedure is performed.”From a practical standpoint, there is no reason why this concept wouldn’t work in a dental practice setting. However, we have not found a similar provision incorporated in State Medicaid regulations or in State Medicaid Provider Manuals. Nor have we found it to be permitted by private payor dental plans. Therefore, we strongly recommend that you do not bill incident-to in the absence of express guidance from your payor that it is permissible to do so. Instead, take steps to ensure that your dentists and auxiliary staff are credentialed as soon as possible after entering on duty with your practice. The ADA guidance does not make a distinction between whether a dental provider is an in-network or out-of-network participating provider. If your practice is a participating provider, your improper waiver of a patient’s co-payment or deductible would also constitute a breach of contract. Under appropriate circumstances, a health care provider may waive a Medicare co-payment or deductible if a patient can show a bona fide financial hardship. However, care must be taken when waiving these amounts. The improper waiver of a Medicare co-payment or deductible could constitute a violation of the Federal Medicare / Medicaid Anti-Kickback Statute, and expose you and your practice to potential criminal liability. (See HHS-OIG’s 1994 Fraud Alert). Unfortunately, this is a common occurrence, despite the fact that virtually every state Dental Practice Act has strict requirements governing both the level of supervision that must be exercised over subordinate staff and which tasks may not be delegated to unlicensed personnel. B. Unlicensed personnel providing care as a result of an administrative error. This typically occurs when a licensee fails to pay their annual licensing fees in a timely fashion or fails to complete mandatory Continuing Dental Education (CDE) required by their State Dental Board. If you are performing dental procedures and your license has been administratively suspended, a reviewer will still deny each of the claims where you are listed as the treating dentist. 6. Unbundling. Fundamentally, when a health a care provider engages in “unbundling,” he / she takes a global code and breaks it down into its fundamental parts for billing purposes. The billing of the separate components then yields more than the billing of the single global code. For instance, in some States, the Medicaid dental coverage and payment rules in place require that cleanings, x-rays, and examinations be billed as part of a single visit. Similarly, some State Medicaid dental coverage payment rules require that x-rays, oral / facial images, and pre-orthodontic visits be billed as part of a comprehensive orthodontic code. 7. Upcoding. Billing for a dental service or procedure at a higher level than was actually provided is known as “upcoding.” An example of upcoding is illustrated by the August 2017 prosecution of a dentist out of Charleston, West Virginia who pleaded guilty to upcoding. 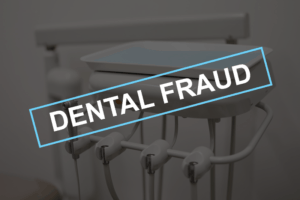 According to the government, the defendant falsely billed Medicaid and its Managed Care Organizations (MCOs) for complex dental procedures (such as the extraction of impacted teeth), when in fact, he actually performed simple extractions. As a result of this false reporting, Medicaid and its MCOs paid the defendant dentist $172 per extraction of each tooth, rather than $80 per tooth for a simple extraction. The dentist further admitted that he falsely upcoded at least 7,490 tooth extractions, billing more than $1.3 million for those procedures. He further admitted that if those extractions were medically necessary, and if had actually performed the procedures he claimed, then he should have been paid only $599,200. III. Don’t Wait Until You Are Facing a Dental Claims Audits – Review Your Practices Now! Do you have an effective compliance program in place? How would respond to the following questions? When was the last time you conducted an internal dental claims audit and examined whether the services you are providing fully reflect medical necessity requirements, are documented to meet the requirements of the payor, and are properly coded and billed? What did you find? Who conducted the audit, someone from your dental practice, or an outside dental consultant? Be sure and engage any outside dental consultant through legal counsel. Keep in mind, this is not a paper exercise. If legal counsel is not fully engaged and is not supervising the work, it is doubtful that the result of any review will be privileged. As a final point in this regard, keep in mind that any overpayments identified must be paid back, regardless of whether the results of the dental claims audit qualify as privileged. When was the last time you conducted an audit of your dental business practices? Are your practices free of any possible violations of the False Claims Act or Anti-Kickback Statutes? Have you fully implemented each of your obligations under HIPAA and HITECH? If subjected to an unannounced audit by the Office of Civil Rights or one of its contractors (yes, this can occur), will you be able to show that you are in compliance with all required security, privacy and technical mandates under HIPAA / HITECH? Do you have an effective anonymous compliance reporting mechanism in place? Have you advised and trained your dental practice staff on their obligations to report improper billings or conduct to your practice’s Compliance Officer? Are you screening your dental practice employees, contractors, vendors and contractors through all Federal and State exclusion databases? Working through these steps (and others), can greatly reduce your overall level of regulatory risk and can assist your practice in implementing an effective compliance program. Need help? Give us a call. Our attorneys represent dental practices in both Medicaid and private payor dental audits. Moreover, we can assist you in assessing your current level of compliance so that you will be better prepared if your practice is audited in the future. Robert W. Liles serves as Managing Partner at the health care law firm Liles Parker, PLLC. Our attorneys represent dentists and dental practices around the country in connection with Medicaid audits, private payor audits and State Dental Board actions. For a complimentary consultation, please give us a call. We can be reached at: 1 (800) 475-1906. As the reported notes, the defendant allegedly took in 31% of the state’s total Medicaid payments for IV sedation in 2016. Although not discussed, this very well may be how he was identified as a potential target – through data mining. A copayment waiver based on financial hardship is prohibited if it is not supported by a “good faith” assessment of the individual beneficiary’s financial need. Special Fraud Alert, 59 Fed. Reg. 65372-01, at 65375; 42 U.S.C. § 1320a-7a(i)(6); 42 C.F.R. § 1003.101. The “[r]outine use of ‘Financial hardship’ forms which state that the beneficiary is unable to pay the coinsurance” is insufficient. Special Fraud Alert, 59 Fed. Reg. 65372-01, at 65375.; A copayment waiver based on a failure to collect is prohibited if it is not preceded by a “good faith” collection effort. Special Fraud Alert, 59 Fed. Reg. 65372-01, at 65375; 42 U.S.C. § 1320a-7a(i)(6); 42 C.F.R. § 1003.101. The collection effort must be more than “token” and must be similar to efforts made to collect comparable amounts from non-Medicare patients. Medicare Claims Processing Manual, Ch. 23, § 80.8.1.